Invoice Factoring 101 | How To Take Advantage Of Your Invoices? Competitive businesses have to grow. Grow or die. And yet because they have their cash invested in the previous deal, awaiting payment, they often lack the cash needed for future sales, advertising, set-up, production and delivery. Businesses with clotted financial streams can’t grow. Estimates of the cash requirements for business growth range from 40 to 60 percent. If your business grows $400,000 this year, depending on what industry you’re in, you’re probably going to need to move between $160,000 and $240,000 through your arteries. If you can’t get that lifeblood into the capillaries, your organs begin to shut down – advertising first, then technology, facility leases, utilities and finally payroll. It Takes Money To Make Money. Everybody Knows That! Some people use it as an excuse for paralysis: we don’t have money, so we can’t make money. But resourceful entrepreneurs use it as the starting point for a plan. You can get the money you need to make money. It happens all the time. In fact, it’s universal in growing North American businesses, one way or the other. Of course, growth isn’t universal. An entrepreneur who fails to solve the short-term cash flow puzzle falls by the wayside, and becomes another small business failure statistic. Some are doomed to failure from the beginning, because they never had the business instincts, efficiency, work ethic and marketing savvy required for business growth. But many more are right on the cusp of success, if they can just overcome their short-term cash flow challenges. It’s an aspect of business that’s neglected in college textbooks. For some reason brilliant students emerge from college unequipped to deal with this business-killer. The conventional borrower trudges obediently to a bank to fill out mountains of paperwork and answer intrusive questions, then wait for an answer from a purported “loan committee” on a cash infusion that is typically too little, too late. Or they seek financing from a venture capitalist, who will extract part ownership and control as part of the deal. But a functioning business that has orders to fill, deadlines to meet, can’t wait around for the bank’s salaried loan officer to get back from Cancun or Tahoe. You’ve spent much of your cash fulfilling the previous order, and you need to move on to the next order before the previous customer pays. You’ve got payroll to meet, leases and utilities to pay and advertising to place now regardless of how much income you anticipate next month. The lag between delivery to your customer and payment by that customer is essentially a period when you are loaning your money out. The invoiced amount is an asset on your balance sheet, but it’s money you can’t use for anything else until you’re paid. It’s in this gap where many small businesses meet their doom, despite satisfied customers and robust sales. Don’t let that be you. It doesn’t have to be you, because cash flow is a problem with a solution. Funding account receivables is a skill that will reward you with stabilized finances, working capital for growth, and perhaps even personal serenity. Because your customers value your service or product, account receivables are probably your greatest asset. You are in a position of strength if you educate yourself on leveraging receivables for working capital and stability. How can you research invoice factors? Well, everybody starts with Google. It would be pointless to try to talk you out of that. Just exercise some skepticism and be alert for self-serving content. And don’t get hung up in algebra, factoring polynomials and quadratic equations! Online research will turn up a lot of helpful articles posted by this or that invoice factoring company. They want your business, and they’ll find a way to drop their sales pitch into the conversation, but the information is generally reliable. RELATED ARTICLE: What is Factoring to a Small Business? To really drill down and equip yourself as an invoice factoring wizard, get in touch with a university library’s business specialist. The price is right. Go on the library’s website and look under staff. Sometimes they call their specialists “subject bibliographers.” If it’s a state university, you’re already paying their salaries. They’re good about answering email inquiries. Ask them to recommend some reading for you, or ask them a specific question. They may not know the answer, but they’ll get back to you. It’s rare that reference librarians at a municipal library will have this level of expertise, but in some cases they do. Even a generic reference librarian can buckle down and be helpful if you keep asking questions. Once you find a helpful reference librarian, stay in touch. Send them Christmas cards. If you live close enough, invite them to Starbucks. You want them on speed dial for your future business research questions. Eventually you’re going to need to get your information from the invoice factoring company that you’ve selected. Some of the information will be specific to your transaction with that company – documentation requirements, deadlines, turnaround times, fees, limits, etc. 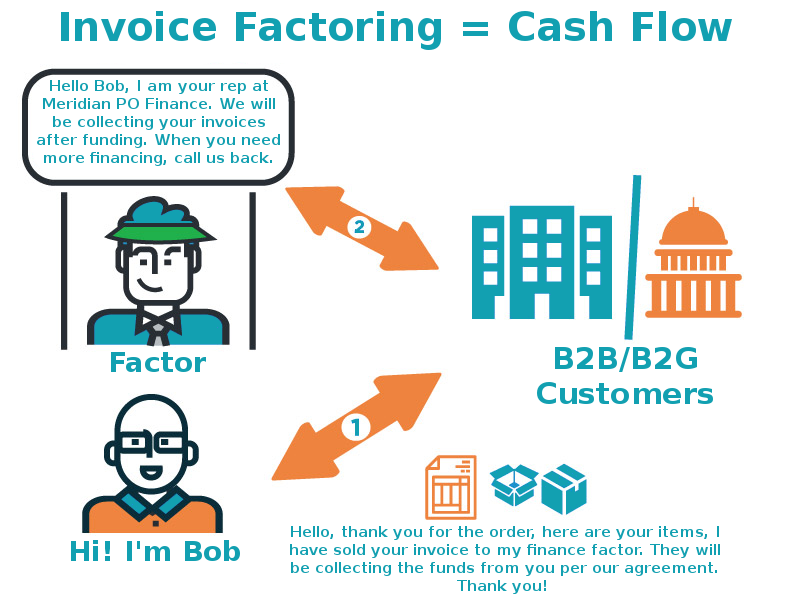 How Can An Invoice Factoring Company Help? An invoice factoring company will typically advance you 70 to 85 percent on your creditworthy invoice, assume the burden of collecting it from your customer, deduct its 2 to 4 percent fee upon full payment, and remit the remainder to you. This is a much quicker process than a bank loan. It’s not unusual for Meridian PO Finance to approve deals within 24 hours of receiving a complete application. You should select an invoice factoring company that is responsive, that has prompt turnarounds, and that is either in your time zone or in an earlier time zone, so they’re not closing up shop just as you’re getting back from lunch. The invoice factoring company should make the application process as user-friendly as possible. Meridian PO Finance, for example, has its application forms posted online at its website. You’ll want to set up an ongoing account so that you can bring them future invoices without starting from scratch each time. After your customers have paid a few invoices on time, your factor may have enough confidence to offer you funding before production, before there are any invoices, based on the purchase order. It will be to your advantage to select a company that can offer both kinds of factoring – accounts receivable and purchase order. This allows one-stop, tailored solutions to your complex future working capital needs. Invoice factoring isn’t just for struggling start-ups. Unlike banks that are legally required to keep cash reserves against their loan portfolios, an invoice factoring company only needs to match the amount of the creditworthy invoice to be advance. Thus the amount is limited only by the size of your creditworthy invoice. (Meridian PO Finance advertises that it can advance funds on invoices up to $10 million, but probably wouldn’t turn down larger deals, so long as the invoiced customer’s credit is solid).